I study risk-sensitive control of safety-critical systems. Risk-sensitive control refers to decision-making in an uncertain world with the realistic perspective that harmful events can occur but do not always occur. I am particularly interested in developing risk-sensitive decision-making tools to address problems in healthcare and the environment. Managing systems in these domains is challenging because the underlying dynamic models are unknown, or are high-dimensional, and large time series data sets are usually not available. So far, I have focused on building models and developing methods to inform cancer treatment and stormwater catchment design in the presence of uncertainty by working closely with domain experts. Recently, I gave a Decision and Control seminar at Georgia Tech describing my research to date (slides). An important problem is to determine the degree of safety that a given dynamic system can attain in an uncertain world. This problem is particularly relevant for designing a system and its controller before they are deployed. Existing approaches typically assume either worst-case outcomes (which yields overly conservative solutions) or expected outcomes (which neglects the possibility of rare events). An improved approach would seek a middle ground that allows practitioners to modify the level of conservativeness as needed. Toward this end, we are devising a risk-sensitive reachability approach for safety of stochastic dynamic systems using existing theory of reachability analysis and risk measures (paper). We have recently demonstrated the utility of reachability analysis to inform the design of stormwater systems (paper, slides). An illustration of a stormwater catchment that consists of two retention ponds in series. Inspired by a real system in Lenexa, Kansas. Modern stormwater systems are designed to satisfy safety and performance criteria under a restricted set of artificial scenarios since weather is hard to predict and public funding is limited. As recent circumstances suggest (Texas floods, Hurricane Florence), standard design practices do not properly account for rainfall uncertainty, rapid urbanization, or rare extreme storms. We see risk-sensitive reachability as a tool to evaluate candidate designs (e.g., green infrastructure, outlet sizing, or active controllers) in a realistic way that accounts for dynamic coupling and low-probability high-consequence events. A poster that I presented at the 2018 Re-Inventing the Nation's Urban Water Infrastructure (ReNUWIt NSF Engineering Research Center) meeting is here. Our 2018 AGU Fall Meeting poster, which I presented with Kevin Smith in Washington, DC, is provided at this link. This is joint work with Jonathan Lacotte, Aviv Tamar, Donggun Lee, Kevin Smith, Victoria Cheng, Jaime Fisac, Susmit Jha, Marco Pavone, David Freyberg, and Claire Tomlin. We are building data-driven models of cancer cells that express different sets of observable traits (paper, slides). Using these models, we can infer transitions that occur between different types of cells over time under anti-cancer therapy. We have demonstrated that such dynamic behaviors are related to the onset of drug resistance in triple-negative breast cancer (Nature Comm paper). A schematic of a phenotypic-state dynamic model that we identified using breast cancer cell line data (Chapman et al., 2016). In addition, we are studying drug schedules for cancer treatment, where the order and timing of drugs must be determined. 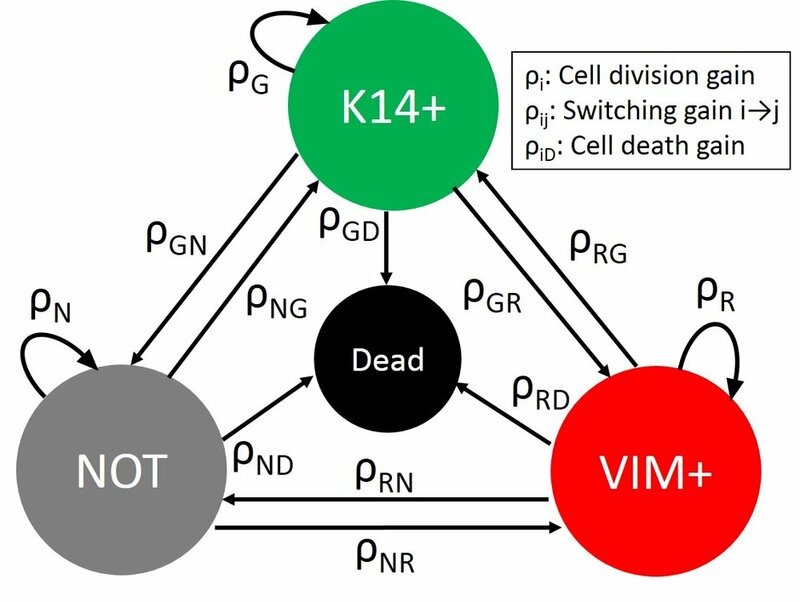 Under particular conditions on modeling error (which arises partly due to uncertain drug-drug interactions), we have shown that a cyclic drug schedule with long waiting times between treatments can kill a cancer cell population in theory (paper, slides). It is not possible to test all drug schedules empirically, but we are hopeful that mathematical analysis will help identify which experiments are likely to be fruitful. By augmenting our models with a measure of drug side-effects, we are working towards identifying drug schedules that reduce the risk of cancer growth as well as toxicity. We look forward to future work with the SMMART Program to study the effects of drug schedules in a clinical setting. This is joint work with Tyler Risom, Ellen Langer, Anil Aswani, Eric Mazumdar, Rosalie Sears, Joe Gray, and Claire Tomlin.